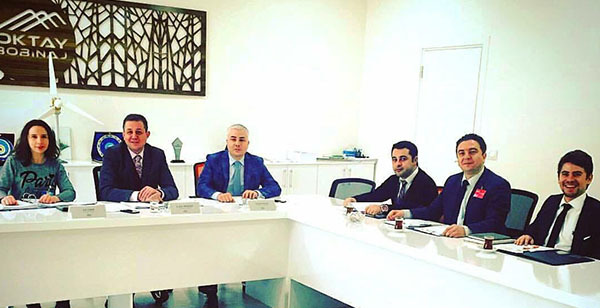 The largest company of the Holding, Oktel A.Ş. It was established in 2006 and is the biggest supplier of enamelled copper and aluminum wire in Turkey. Founded in 2011 with the joint venture capital at Manisa Industrial Zone, HMA Foundry is one of Turkey's biggest Aluminum Injection plants as a machine park and capacity. Oktay Bobinaj, which is the oldest company of the Holding, was established in 1963 and serves to 2000 customers as a supplier of electric motor winding, repair and spare parts in Bursa and surrounding areas. Oktel Copper and Aluminum Limited Company started to operate with its new facility in Istanbul IMES Industrial Zone. Oktel continues its activities in Bulgaria, Plovdiv-based facilities as Oktel Bulgaria OOD. Ok Enerji Bearing Industry started to sell bearings and transmission organs on demand in 2013, even though it was established as an energy trading company in 2010. Heinz Linear, established for producing professional electromagnetic systems with professional crew. Heinz Parts is providing of Port Machinery Spare Parts, Wire Ropes, Cabels, Filters and Tires. Nominis Yapı & İnsaat has set out to create houses that meet modern living standards. Oktel continues its activities in Serbia, Beograd based facilities as Oktel Serbia. For more information about Oktay Holding A.Ş. Oktay Holding A.Ş., which produces daily added value for the industrial sector from 1963. Continues to add a new day to investment studies every day. In 1963, Oktay Holding A.Ş., which diversified its winding production route with winding, enamelled coil wires and electric motors, Continues to grow.